You might say these little ones are having heart attacks. We don’t usually think about little children having a heart attack. The kind of “heart attack” I’m talking about is affecting thousands of children. It is the emotional and spiritual heart attack they experience when their family falls apart. The family could be a divorcing family or a never married family. To a child, it makes no difference if their parents were legally married or involved in a cohabitation situation. Many children are experiencing a monumental crisis at an early age in life. To a child, an emotional heart attack can be as devastating as a physical heart attack in adults. Said another way, these children are traveling through a devastating life event. 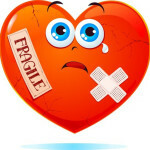 The emotional heart attack can leave scars that will affect the child when they become an adult. As they try to form relationships or enter into a marriage, they may be lacking in relational skills. Spiritual lives may be affected as they struggle to understand a Heavenly Father when they have no relationship with an earthly father. A relationship with Christ may be hindered because they can’t understand how anyone could love them enough to die on the cross for their soul. How can we expect them to understand Christ as a Savior when one of the parents walked away from the family? Church leaders and loving Christian adults can be the catalyst that mends the broken heart. You can be the one that soothes the pain of the heart attack. You can be the one that applies the salve to the hurting heart. You might be the only person that makes a difference in a child’s understanding of life. More than anything you can be the one who recognizes a child-like heart attack. Krista Smith is not a licensed counselor. Any comments or suggestions she makes are only based on her personal experience and what she has learned through working with hundreds over the past 15 years of experience. If you are seeking professional help, please seek a licensed therapist. The Slippery Slope is a new interactive board game designed to help players open up and deal with their emotions and feelings that are associated with the grief they feel when they are separated, going through a divorce, or living through the aftermath of a single parent family. The Slippery Slope game will help you guide your kids through the emotional process of grief while sharing grace and forgiveness. As our gift to you, we want you to have your own copy of 101 Ways to Create a New Life After Divorce"
Copyright © 2019 Journey Through Divorce | Hosted by: TT Inc.